Taking a water adventure ride with the Branson Jet Boats during summertime is a unique way to enjoy Lake Taneycomo. 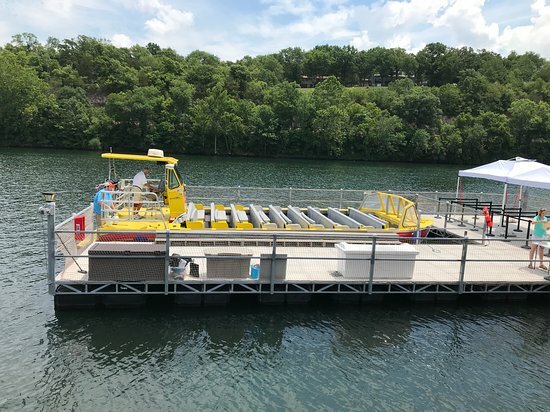 As one of the newest attractions in Branson, the jet boat provides visitors a fantastic lake excursion tour that departs from Branson Landing and cruise along Lake Taneycomo allowing all passengers to enjoy magnificent views of the many spectacular attractions along the lakeside. This jet-powered boat will take you for a fantastic lake cruising where you can experience a full 360 spinouts, power stops and expert maneuverability of the captain. Unlike propeller-powered boats, you’re sure to enjoy a one-of-a-kind water adventure on the lake. As you take a fantastic water ride adventure with the jetboat, you’re sure to experience an excellent fun and excitement as the boat rips the clean and clear waters of the pristine Lake Taneycomo. The jetboat has a guide to help you gain more knowledge as he narrates about the history of the Ozarks and many other attractions that you pass along. This great water adventure ride with the jetboat can help you cool off if you are enjoying the fun ride during summer time. This brand new water adventure is perfect for any water enthusiast. As the boat travels in full speed, you’ll feel the air snaps your face and the cool water sprays from the boat which create an unforgettable memory of your summer vacation in Branson. Once you get onboard the Branson Jetboat, you will immediately feel a fascinating water ride experience like no other as the boat goes near the deep calm waters of Lake Taneycomo. Unlike traditional craft that uses a propeller, the jetboat can’t navigate on shallow water, but with the boat’s typical draft of only 12 inches, there’s nothing to worry cruising into shallow water on the lake. This means that Branson Jet Boat has less chance of striking an underwater object or running aground. And even if it does happen, this jet boat has far less resistance – thanks to its lighter weight and sleek bottom, the captain will find it easy to maneuver and avoid being stuck. If you want to enjoy a safe and comfortable ride adventure with the jetboat, you must not forget to include in your bag sunglasses, hats and towels to protect you from the heat of the sun and water splashes. These items can be purchased at the kiosk in Branson Landing. You can also bring a camera or cell phone along at your own risk. A waterproof cellphone case can also be purchased at the kiosk. 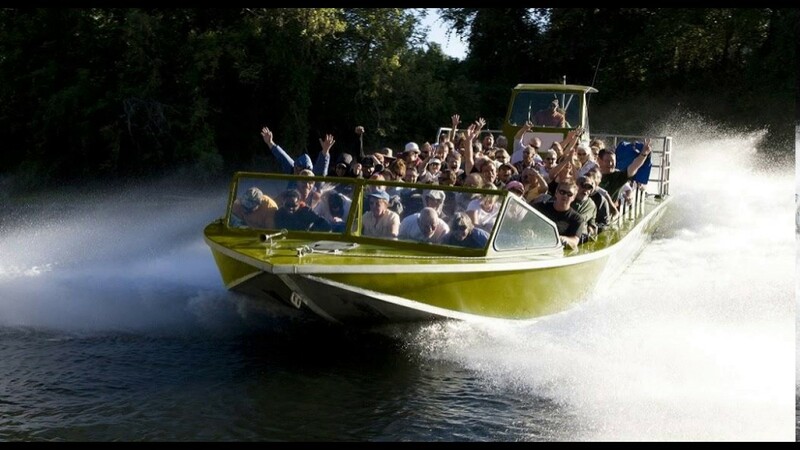 Participating guests on this jet boat excursion tour are encouraged to arrive 15 minutes before the jet boat adventure begins. As you take a fascinating and thrilling water adventure with Branson Jet Boat on the lake, you’ll be seeing many spectacular views and beautiful natural sceneries as the boat cruises into the main channel of Lake Taneycomo. When taking a fascinating water adventure ride with the jet boat at Lake Taneycomo is not enough, there are many ways to enjoy a wonderful summer vacation with the whole family and friends in Branson. Your summer vacation in Branson will provide you more fun if you can have the chance to rent a boat, go fishing, or explore the beauty of the lakes. The pristine waters of Table Rock Lake, Lake Taneycomo, and Bull Shoals Lake are perfect vacation destination spots during the summer season as these areas offer many exciting water activities and many great outdoor adventures. The tri-lakes area in Branson offers world-class water adventures that include swimming, wakeboarding, scuba diving, water skiing, boating, and much more. These lakes in Branson all feature beach resorts waiting for those who love swimming and other fantastic water fun activities. The resorts and marinas in all the three lakes all feature an array of boat rentals including bass boats, pontoon boats, ski boats, and wave runners. As Branson is connected with the three lakes, it makes the place the best vacation destination during the summer season. Many visitors consider the tri-lakes area as a great vacation destination where you’ll find it fascinating to enjoy exciting activities and thrilling adventures. As boating is one of the premier water sports adventures in the Ozarks, boating enthusiasts who don’t own a boat, can still enjoy ultimate summer vacation in Branson as they can avail boat rentals at State Park Marina, Lake Taneycomo Boat Rentals, and at Indian Point Marina. State Park Marina has got everything on the water, including boating, fishing, and daily sailing with The Spirit of America, a 48-foot sailing catamaran. When you want to experience boating adventure by yourself, there are many options to rent a boat from wave runners, ski boat, pontoon boat, bass boat, and much more. Lake Taneycomo Boat Rentals is another boat rental operator that offers a safe, clean, comfortable and reliable boat rental service. Why take a hard time bringing your boat, hauling it in and loading it back. Here you can rent different kinds of crafts. You can also grab a tackle, bait, snacks, and drinks. If you want to experience a unique water adventure, try watercraft with paddles. Lake Taneycomo has other boat rental operators that include Lilley’s Landing and Trout Hollow where you can rent a small yacht or sailboat. Indian Point Marina is another full-service marina in Branson that offers various sports equipment on the water. As a first time Branson visitor, you’re to appreciate with their wide selection of rental craft which includes tri-toons, pontoons, deck boats, and wave runners. This marina also has a gas and pump station, a tackle store complete with live bait, fishing licenses, groceries, and camping supplies. When are feeling hungry, there’s a floating cafe inside the marina that offers a full menu of breakfast, lunch, and dinner. As one of the newest and the fascinating attractions in Branson, Branson Jet Boats is sure to provide you a unique water adventure ride with the opportunity to see many spectacular sceneries at Lake Taneycomo.